Long before John McNamara kept Bill Buchner at first base in the bottom of the ninth inning of that sixth game of the 1986 World Series, the legendary “Marse Joe” McCarthy made a fateful managerial decision of his own that helped end another Red Sox postseason in heartbreak. McCarthy had taken the Red Sox job in 1948, two years after resigning as Manager of the Yankees because he couldn’t stand one of New York’s new co-owners, Larry MacPhail. By sweeping his old team in a two game set that ended Boston’s regular season, he had maneuvered his first Red Sox club into a first place tie with Cleveland. 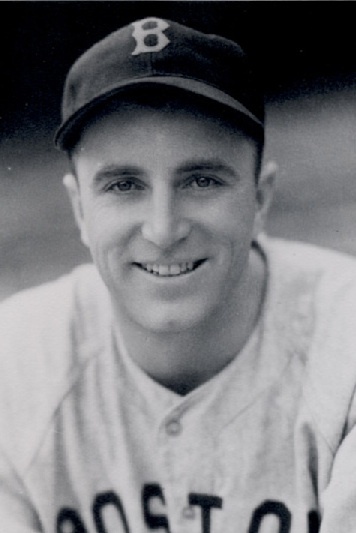 He had won seven World Championships as Yankee skipper and if Boston could win a one-game playoff against the Indians, McCarthy would have the opportunity to win his eighth ring. The big decision he had to make was who to start on the mound against the Indians. He made a controversial choice by going with his fifth starter, a 36-year-old, thirteen year veteran right-hander named Denny Galehouse. The Marshallville, OH native, who was born on December 7, 1911, had begun his big league career in 1934 with Cleveland. Four seasons later, the Indians traded him to Boston for outfielder Ben Chapman. He went a combined 15-16 during his first two-year stop in Beantown and then was sold outright to the St. Louis Browns in December of 1940. He became one of the Browns’ best wartime hurlers and had pitched especially well in the 1944 Cardinals/Browns World Series. Boston had purchased Galehouse back from the Browns in June of 1947 and he became one of the Red Sox best pitchers during the balance of that season, going 11-7 with three shutouts. The Red Sox 1948 rotation was a strong one, led by Joe Dobson (16-10) southpaw Mel Parnell (15-8) and two more former Browns, Jack Kramer (18-5) and Ellis Kinder (10-7). Galehouse’s record as the fifth starter had been 8-8 that year. Dobson had started the season finale against the Yankees and Kramer the one before that. Since Boston was trying to catch Cleveland, McCarthy had been forced to treat both Yankee games as do-or-die situations and had his other starters warming up in the bullpen. Most Boston sports pundits thought the veteran skipper would go with Mel Parnell on three-day’s rest because the lefty had pitched very well against Cleveland that season. Kinder had also been pitching well in his most recent starts and was also decently rested. Instead, McCarthy gave the ball to Galehouse. The Manager later explained that he chose Galehouse because he had pitched a great game against the Indians the last time he faced them in Cleveland. But since that start, Galehouse had faced the Tribe two more times in Fenway and been hit hard in both games. In any event, Galehouse made the start and gave up a solo home run to Lou Boudreau in the first and a three run shot to Ken Keltner in the fourth and the Red Sox lost 4-1. Years later Galehouse was interviewed and asked a question about McCarthy’s decision to start him in that crucial contest. He reminded the questioner that he had thrown about six innings worth of pitches warming up in the bullpen the game before and that the other available Boston starters had let it be known they were not ready for assignment. I wonder if Parnell and Kinder were eating chicken and drinking beer in the Boston clubhouse during that Yankee series. What do you think?